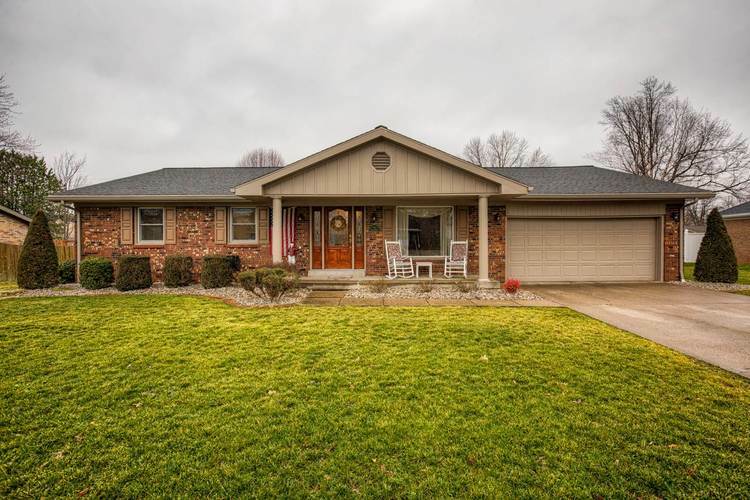 Spacious & updated Brick Ranch with an attached 2 car garage. While sitting on the front porch, enjoy the peaceful, well established neighborhood. The large backyard features beautiful landscaping, a nice deck & a large outbuilding nestled under a large shade tree. Inside you will find approx. 2000 sq. ft. that consist of 4 Bedrooms, 2 full Baths, Family Room with fireplace and access to deck & backyard, & a Formal Living Room. Off the Master Bedroom is the Sun room with windows flanking 3 sides & a gas stove. The dining & kitchen area includes a bar for additional seating. Utility room off the kitchen gives access to back yard. Appliances included: refrigerator, stove, dishwasher, microwave & includes the washer, dryer, & water softener. Updates within the last 5 years: interior painted throughout; guttering, downspouts & soffits replaced; new wood flooring & carpeting throughout. Listing provided courtesy of KEY ASSOCIATES OF SANTA CLAUS.